WTF?! - Dolce & Gabbana Disgustingly Compare Themselves to Charlie Hebdo - "Je Suiss D&G"
After trying to weedle their way out of their anti-gay comments on Sunday by releasing a statement reading: “It was never our intention to judge other people’s choices. We do believe in freedom and love.” and that Dolce was expressing his personal views “without judging other people’s choices.” Stefano Gabbana seeing it was not working took to Instagram not much later to compare their situation to that of Charlie Hebdo magazine which was the victim of a gun attack o, which left 12 people dead. The unmitigated gall of comparing and playing victim to tragedy where people are physically attacked and killed for satire is very different from people choosing to not to buy D&G’s overpriced crap because they offended millions of people. It is not only insane but offensive beyond words. How dare they exploit other people’s deaths and compare it to them losing profits and reputation. 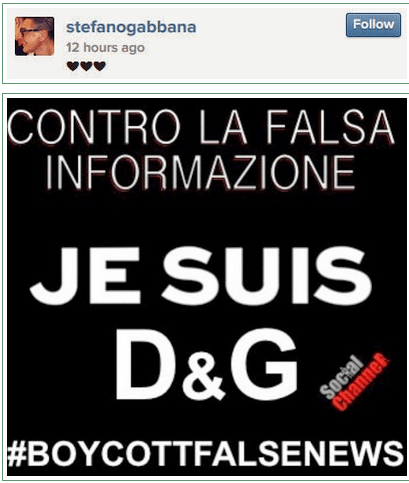 If their original remarks were not enough to drive you to #BoycottDolceGabbana this is. Chick-fil-A’s NEW Ad – Pass It On! Pingback: Self-loathing Tacky Designer Stefano Gabnana of D&G: "Don't call me gay!"